THIS beautiful custom 2 bedroom. 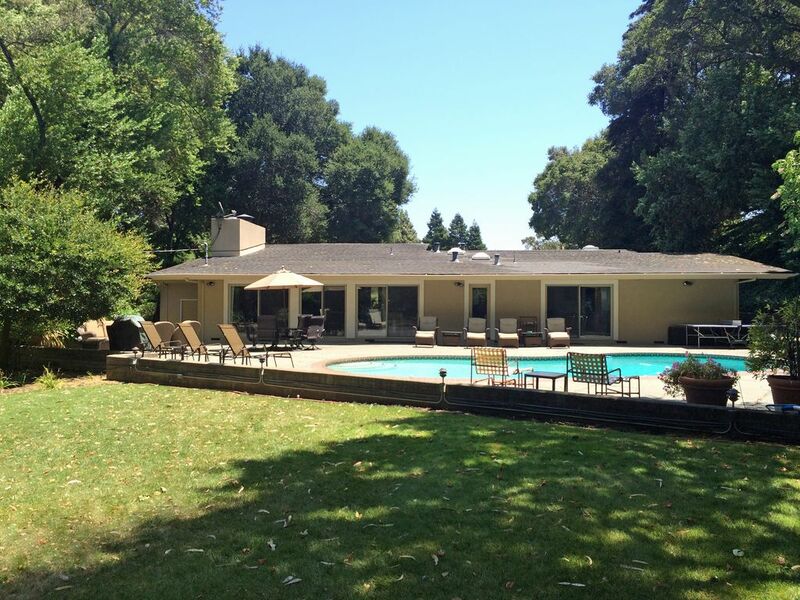 2.5 bath home with pool is located on a private California ranch near the Wine Country. The ranch is over 300 acres, so privacy in this wonderful country setting is a treat unto itself. BUT there is so much more. The property is located just off Interstate 80 and California Highway 12. Both are major connectors to all the fun, beauty & excitement California has to offer. Hwy 12 is the route to the Wine Country & 20 minutes of driving will find you in Napa. A few more miles up the road are Yountville, St. Helena & Calistoga & all the great wineries, restaurants & shopping this area offers. Or maybe you're interested in seeing the Sonoma Wine Country. It too is an easy drive. Maybe you are looking for some city life. Traveling from The Guest House, San Francisco is 33 miles on I-80 or a delightful one hour ferry ride and California's state capitol, Sacramento, is 50 miles. PLEASE BE ADVISED, THE HOUSE IS NOT AVAILABLE FOR PRIVATE PARTIES OR AS A VENUE FOR ANY EVENT. Reservations are not accepted for venue type events, i.e. birthday parties, reunions, bridal showers, weddings, etc. The home is reserved ONLY for overnight stays of occupants on contract. The living area is a large open space with living room area, dining & kitchen. The furnishings in the home are high quality & were chosen for this home. The large screen HD television in the living room has surround sound, satellite receiver with HBO, Showtime, Encore, Starz, DVD player, DVD library, iPod dock, iPod (5 & above iPhone adapter), stereo & AUX Plug setup for playing your own music, videos, pictures of the day, slide shows, etc through house system. There is a large gas jetted fireplace. A piano adds loads of fun if anyone plays. Full wet bar complete with glassware, wine openers, ice maker & wine frig. The kitchen is fully equipped with all the utensils for cooking & dining. Granite counter tops throughout the kitchen. Gas cook-top, dishwasher, refrigerator/freezer, full upright freezer, & in the laundry room full-size washer and dryer. Free WiFi and hard wired internet, Dell laptop computer and HP All-in-One printer are provided. Computer loaded with website links to area points of interest. Each bedroom is an en suite and has a King bed and its own flat-screen television with individual satellite receiver that have HBO, Showtime, Encore, Starz. The private bath connected to each bedroom has a tub and stall shower. All the showers are tile as are the counters. In the master bath, there is a vanity & large walk-in closet. But that's not all. Outside is the private pool, propane barbecue, extra tanks are provided, umbrella-ed dining table with 6 chairs, a double chaise lounge, 4 single chaise lounges, 4 club chairs with ottomans, conversation area with love seat, club chairs, ottomans, coffee table, ping pong, badminton, lawn bocce, croquet, stereo speakers. PERFECT for enjoying a sunny hot day or an evening in the cooling evening air. Greeting you upon your arrival is a delicious box of See's Assorted Chocolates a California favorite, and two bottles of Napa Valley wine, a Chardonnay & Cabernet Sauvignon. All the treats are personal favorites of mine. Property has security gate entrance. My sister and I own the ranch. We have had so many wonderful experiences over the years we thought others might enjoy this unusual but convenient destination. Numerous attractions and destinations are noted on the map. This vacation rental was not purchased as a vacation rental, it's a ranch. My family bought the ranch in 1960. Cattle graze on the acres, horses are raised and a sophisticated country life is enjoyed. Our location is one of the best in our area. Twelve to thirty-five miles from destinations travelers hope to see when visiting the Northern California Napa Valley and San Francisco Bay Area. My professional background is hotel management. So with my experience, knowledge and attention to detail every aspect of your stay is scrutinized, from the amenities throughout the house (cotton balls, Q-tips, bottled water, cooking spices, condiments, laptop computer & printer, Free WiFi, movies, iPod loaded with music, HDMI hookup for TV, iPhone adapters) to the beautiful arrival gift made complete with a select bottle of Napa Valley Chardonnay and Cabernet Sauvignon, See's chocolates and other goodies. Private, unique country setting that provides convenient, easy access to major highways for your adventures throughout the Napa/Sonoma Wine Country and Northern California. 11 miles to Napa, 25 miles to St Helena, 33 miles to San Francisco, 50 miles to the Pacific Ocean, 60 miles to Sacramento...easy connections to Highways 80, 680, 12. Free WiFi. 2.5 bathrooms. Each full bath has a stall shower and full size bath tub. Provided for stay paper products (toilet paper/facial tissue), shampoo, cream rinse, hand soap, body wash, Q-tips, cotton balls, plush towels, air freshener. 3 telephones. Located in kitchen and each bedroom. All 500+ thread count sheets & pillowcases, down pillows, blankets, duvets provided. Down comforters. Throw blankets also provided. Cloth napkins. Dish towels. Full-size washer located in Guest House laundry room. Private use for house guests only. Full-size dryer. Private use for Guest House guests only. Located in Guest House's laundry room. Large wood burning fireplace with gas jets. Firewood provided at no additional cost during winter months. Attached 2 car covered carport, plus additional parking in front of the Guest House. Recreational vehicles hooked up to house's electricity &/or water will incur a $100.00 per day charge. 2 car covered carport, which is attached to the house. Internet access through Broadband connection. Dell computer provided with all-in-one HP color printer. Open floor plan, wood fireplace, wet bar, wine frig, ice maker, leather couch, coffee table, club chairs, ottoman, HD television, DVD player, iPod, Direct TV w/ HBO, Showtime, Encore, Starz, etc. Side by side refrigerator freezer. Stand alone ice maker at bar. Cuisinart coffee maker with gold filter. Paper filters available. Peet's coffee provided. Olive oil, Balsamic vinegar, cooking oil, salt, pepper, spices, flour, sugar, coffee, tea, bottled water, paper towels, toilet paper, tissue, aluminum foil, plastic wrap, ketchup, mayo, mustard, etc. Full set of dishes, flatware, mugs, glass and plastic wine & beverage glasses, cooking pots & pans, mixing bowls, Picnic items, cloth & paper napkins, placemats. Complete with gas range, double ovens, microwave, instant hot water, garbage disposal, small appliances (drip coffee maker, slow cooker, blender, mixer, food processor, hand mixer, blender, etc. Beautiful high gloss plank wood dining table with 8 chairs. Large HD TV in living room & HD TV in each bedroom. All have Direct TV satellite receivers with remotes. All offer premium channels including HBO, Showtime, Encore, Starz. (3) Each HD television has its own Direct TV satellite receiver. Premium channels include HBO, Showtime, Encore, Starz. Surround Sound system with outside speakers for enjoying while at the pool. HD DVD player in Living Room. Coffee Table books about the wine country and variety of fiction novels. Local area informational books, pamphlets, maps about Napa & Sonoma wine country. An Ipod is provided with a vast music selection. Many satellite music channels available. Ipod docking station available for your own Ipod. Outdoor speakers around patio/pool area. DVD's are provided for your viewing enjoyment. Pay per view is also available at an ADDITIONAL CHARGE. Large lawn surrounded by native trees and fencing. Great for croquet, lawn bocce, & badminton. PRIVATE PATIO totally furnished-Umbrella table & 6 chairs, 4 Club Chairs & ottomans, Large conversation area, 1 dbl chaise, 4 sgl chaise lounges. Outdoor speakers, Ping Pong, BBQ, Croquet, lawn bocce. Private pool & patio w/ outdoor furniture, propane BBQ, ping pong, badminton, croquet, outside stereo speakers. NO SECURITY FENCING. Pool heated at an additional charge from October thru April. Large beach towels provided. The Guest House* is situated on a 300+ acre private ranch with easy & immediate access to every major artery in the area. The tranquil country setting is complete with huge old growth trees, deer, turkeys, squirrels, rabbits, coyotes, foxes, cattle, and horses. It is splendid to sit on the Guest House’s private patio with a favorite beverage or when dining and view the lush native trees surrounding you and transporting you to a place where relaxing is a way of life. *PLEASE BE ADVISED, THE GUEST HOUSE IS NOT AVAILABLE FOR PRIVATE PARTIES OR EVENT. Reservations are not accepted for venue type events, i.e. birthday parties, reunions, bridal showers, weddings, etc. The Guest House is reserved ONLY for overnight stays of occupants named on contract. Ice machine is a stand alone ice maker, which is built into the bar. Picnic utensils with rolling cooler provided; plates, eating utensils, napkins, drinking cups, folding chairs (2) etc. What a fantastic escape from the hustle and bustle of Napa and Sonoma but close enough to get their easily. Eileen was a perfect host. Her place is so nice and comfortable, with so many little touches to make us feel welcome and right at home. We had a hard time leaving it. We hope to be back soon. It would be lovely to welcome you again. I look forward to that opportunity. We chose to stay here to unwind after Thanksgiving, and it was a WONDERFUL decision! This house felt warm, cozy and luxurious all at the same time! We all thought it was more beautiful than the pictures. Eileen was very responsive and helpful, giving detailed information along the way. We were greeted with two great bottles of wine and two boxes of See's candy when we arrived. By far, the nicest welcome gift I've ever received from a VRBO or airBnB. The place was so spacious! We had two huge bedrooms with private baths, tubs and showers. Everything seemed to have been chosen with love and comfort in mind. At this property, all of the amenities matched and felt newly purchased for us to use. It was private and safe and absolutely lovely! Thank you Eileen for sharing your guest house with us!!! We couldn’t have asked for a better place to stay to enjoy wine country than this house. Very close to Napa and the up and coming Suisun Valley wineries, we made our daily jaunts out for wine tasting and dining very easily. The house was perfect for 2 couples with 2 large bedrooms with big bathrooms. The living room area was very welcoming with lots of comfortable seating, fireplace, tv, music, and a wine fridge. Even though we didn’t cook in, the kitchen had everything that you’d need for dining. We didn’t use the pool either, but it looked beautiful and had much seating around it. We will definitely be back to this property as it truly met our needs. Thanks Eileen for a great place. Great location just a short drive from Napa. Great place for two couples to kick back and relax after a day of touring the wine country. Eileen is a wonderful hostess. She was very responsive and provided a wealth of local information. The Guest House is in an ideal location with easy access to all the great things Northern California and the Wine Country have to offer. A short drive will take you from the bucolic wine country to the California coast to the enchanting City by the Bay, San Francisco. PLEASE BE ADVISED, THE HOUSE IS NOT AVAILABLE FOR PRIVATE PARTIES OR AS A VENUE FOR ANY EVENT. Travelers w/ extended stays contact owner directly by email/telephone. Holiday mini 2n. Addi guest $75.00 pp, per night for over 4 adults. October through April optional per day pool heating charge, 3-day mini. Heating charges begin 2 days prior to scheduled arrival. Fee $125.00 pd. Bookings NOT using BOOK IT NOW, not charged Damage Protection fee or VRBO Service fee. A booking contract and credit card must be on file for any charges &/or damage. CANCELLATION POLICY: see PDF Guest House contract.